• 마이크로소프트는 최근 사이버 범죄자에 의해 일부 고객의 Web 기반 전자 메일 계정에 대한 무단 액세스 문제를 깨달았습니다. • 공격자에게는 고객 지원 계정에 대한 액세스와 같은 다른 창이 있었기 때문에 실제로 각 계정에 로그인하지 않아도 영향을 받은 전자 메일 계정을 부분적으로 들여다 볼 수 있었기에, 두 요소 인증을 사용하더라도 사용자의 계정을 보호할 수는 없었습니다. • 그러나 Microsoft는 이 사건으로 인해 영향을 받은 총 계정 수를 공개하지 않았습니다. • 해커는 1 월 1 일부터 3 월 28 일까지 고객 지원 상담원의 자격 증명을 손상시킴으로써 보안 침해를 수행 할 수 있었습니다. • 해커가 전자 메일 주소, 폴더 이름 및 전자 메일 제목 줄에 액세스 할 수는 있지만 전자 메일 내용 (첨부 파일 포함)에는 액세스하지 못했음을 강조하고 있습니다. • The Verge에 따르면 이전의 보안 연구원이 Microsoft 및 Nintendo 서버를 해킹 한 것에 대해 유죄를 인정한 지 몇 주 후 보안 침해가 발생했습니다. “We addressed this scheme, which affected a limited subset of consumer accounts, by disabling the compromised credentials and blocking the perpetrators’ access," a Microsoft spokesperson told TechCrunch. 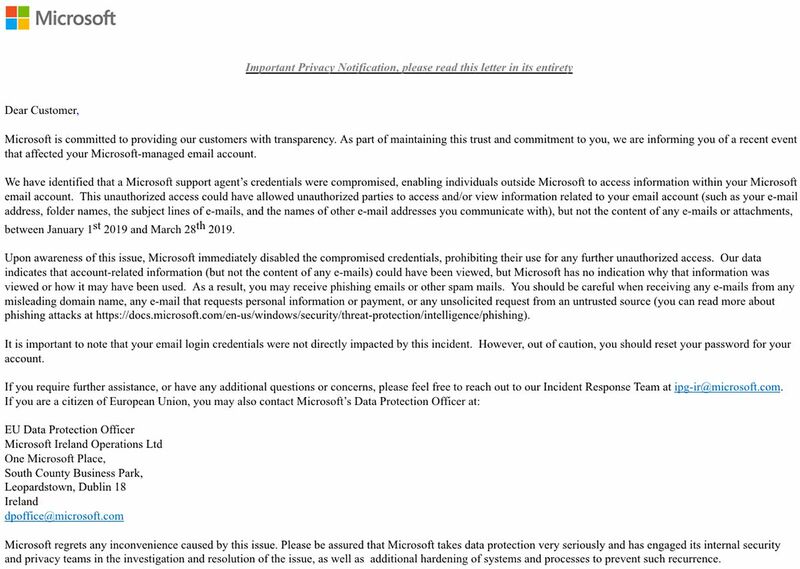 Here’s a copy of e-mail notification #Microsoft sent to affected Outl… pic.twitter.com/poIZN7WmFs"
Microsoft is notifying some https://t.co/QptU2RoqGa users that a hacker was able to access accounts earlier this year.